Cate Insurance Agency has proudly served the insurance needs of Jefferson City and all of Tennessee since 1959. Our independent agency can help you find the best value on auto, home, health, and more. Contact us now for free, competitive quotes. Choose local. Choose independent. Choose Cate Insurance Agency. 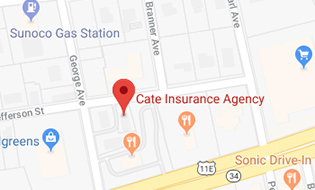 Welcome to the Cate Insurance Agency, one of the oldest and most experienced insurance agencies in the Lakeway Region. Continuing a half century of service to the Lakeway Area, the Cate Insurance Agency of Jefferson City, TN is a proven leader in insuring the present and futures of thousands of families, individuals, and businesses since 1959. The Cate Insurance Agency offers personalized protection plans to cover your auto and home, business, or life and health. Our goal is to partner with you in determining your insurance needs while providing the best customer service possible. We believe that loyalty is a quality that is earned, and that our policyholders deserve the best. YOU are important to us! Serving the greater Lakeway Area and East Tennessee since 1959. We work for you. Call, email, or stop in today and let us help you!